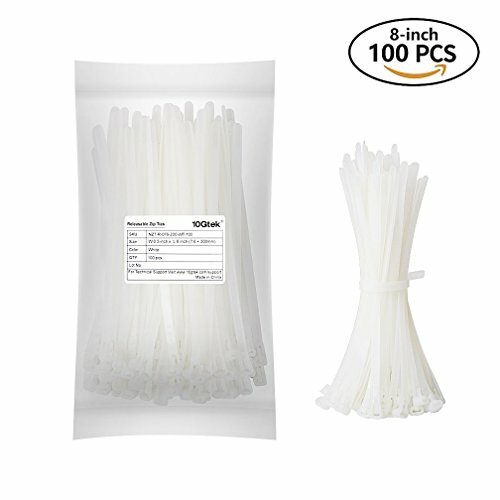 Releasable Zip Ties (100pcs) 8 Inch Nylon Cable Ties in White by 10Gtek at Naml Net. MPN: NZT-R-076-200-WT/100. Hurry! Limited time offer. Offer valid only while supplies last. 10Gtek Reusable 8 Inch Nylon Cables Ties are a great choice for a range of uses from securing small items to organizing home theater cables. 10Gtek Reusable 8 Inch Nylon Cables Ties are a great choice for a range of uses from securing small items to organizing home theater cables. -Nylon zip ties are constructed with fire resistant materials with a 94V-2 flammability rating. Locking teeth in the cable tie head secure cables or wires and release when the latch is pressed. -Ratchet lock is released by pressing the latch; Easier and safer than cutting off ties when no longer needed. -Easily double the 50-pound tensile strength by using two ties together in a row. -Reusable: Organise charging cables, power cords, instrument cables, ropes. -Designed for outdoor or indoor use with small, medium or larger diameter wiring or cables. -Often used for organizing electrical wires & cords, securing loose objects, and other DIY projects. -The white cable ties are placed for too long, there may be subtle chromatic aberrations. Please refer to the actual object received, hoping to understand. Nylon zip ties are constructed with fire resistant materials-Nylon66. Provides a positive and reliable lock when engaged and slips off easily with a press of the release,can be reusable,easy to use and disassemble. Locking teeth in tie head secure cables or wires; Simply use the press-to-release latch to adjust or remove the tie. Used for Organizing Electrical Wires & Cords, Securing Loose Objects, and Other DIY Projects. Releasable Zip Ties are rated with a 50 lb tensile strength; Increase the tensile strength by using two or more together in a row.